Join the OCMC/Project Mexico home building team in 2019 today! The team will work, pray, and learn about missions from July 18 to July 24, 2019. For three decades, Project Mexico has been coordinating teams and resources to build homes for some of the most impoverished families in northern Mexico. 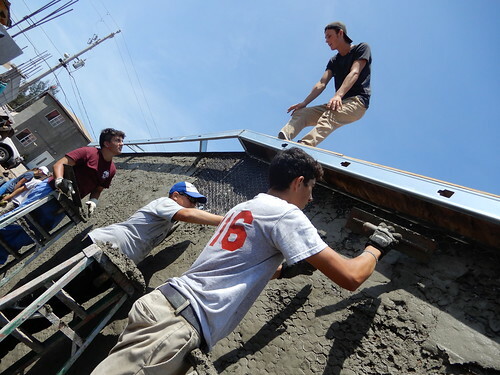 Groups of volunteers from all over the US head to Mexico every year and build each house in just four days. Both the Mexican families and the volunteers consistently come away with life-changing experiences of love, hospitality, and service. Project Mexico also offers a great support to the local community through the St. Innocent Orphanage. At the orphanage, the kids are loved and taken care of, as their daily lives are closely integrated within the Church. This ministry serves as another great witness of our Orthodox Christian faith. With these ministries, Project Mexico’s mission is very closely aligned with ours, and so it’s come very naturally that we have started working together! This began when we did a home build with them in late July 2018, and continued when we teamed up once again for the Swim for Hope fundraiser in September. We are excited to announce that this synergy will be continuing, and we will again be having a coordinated home build in 2019 as well! Next summer, OCMC Missions Week at Project Mexico will be week 5, from Thursday, July 18 to Wednesday, July 24. Over the course of that week, the team will pray together, build a home together, and meet the family who will be moving into the house. The trip cost is $650 + $20 registration fee (airfare not included).